Thank you all for your continuous support! Whether you are Boosters raising funds for our scholarships, sponsors contributing to our rodeo production costs, or supporters helping us with day to day operations, we appreciate all you do! Here is just a brief update as to what you have helped us accomplish this past year. Thank you to Coast Pipe, Ron Bass, the Rodeo Boosters, Home Depot, Cal Poly Ag Ops, Twisselman Construction, Sterling Twisselman, and Flying T Cattle for all their donated materials and efforts to redesign and reconstruct our roping chute, lead up and roping back pens. Thank you to Rodeo Boosters, the elbow grease of so many volunteers and Coast Corral for all the efforts to get our new stalls up and running. Between the existing stalls we fixed last fall and the new ones we built over the summer we currently have 84 stalls in full operation. With some hired help through a grant program we painted our back pens and panels behind our new lead up and roping boxes. Eventually, we intend to replace the entire main arena with oil pipe but this will be the last phase in a several year plan. In the meantime the new paint should keep them looking sharp for a few years. JB Dewar has donated an amazing new office trailer that is quite a bit larger and nicer than our current rented trailer. I am still working with facilities on campus to arrange for the installation of the new unit but am looking forward to the new facility. Thank you JB Dewar! Thank you to Cal Poly Ag Operations and each of the students who helped me this summer as we trenched and installed all new water lines to the facilities. The stalls and arena are now on potable water. The University has granted me some additional class units to create independent study projects for the students. These projects, beneficial to the Rodeo Program, earn the students graded credit hours specific to their majors. This also helps ease the stress on our students as they try to find classes in an over impacted campus schedule. Our Poly Dolly Classic Clinic and Roping was a great success and we look forward to doing more fund raising events for our program. 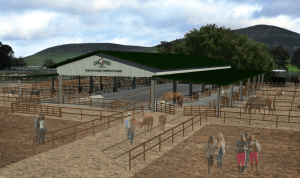 We are well on our way to finalizing the design and planning process for the new “Rodeo Barn”. This will provide livestock cover, hay/grain storage, and a much needed improved livestock handling facility for our program. Currently we have raised $200,000 towards the cost of the barn and are working to obtain the rest.